If you love classic lines and timeless appeal, an engagement ring with a Tiffany setting is a great option. Whether you buy a genuine, trademarked Tiffany solitaire setting from Tiffany & Co. or purchase one of the many rings inspired by this lovely design, you'll find that this simple and sophisticated setting highlights the enduring beauty of your diamond. Although many jewelry companies imitate the Tiffany setting, Tiffany & Co. is the only company to own the trademark on this iconic ring design. First created in 1886 by Charles Lewis Tiffany, this simple prong setting quickly became the signature design of the famous jewelry company. Since then, this design has become a classic. In fact, according to Forbes, the Tiffany round brilliant solitaire is the most popular engagement ring setting in the world. This ring is the ideal choice for brides-to-be who want a timeless ring setting that will highlight, rather than overwhelm, the sparkle and fire of their precious diamond. It's a ring you'll love for the rest of your life, and it even comes with a lifetime guarantee. The Tiffany mount is simple: six prongs securely hold a round brilliant-cut diamond around its girdle (the thickest portion of the stone), elevating it above a plain platinum band. The prongs are spaced equally around the circumference of the stone, mimicking the symmetry of the diamond's shape. You can purchase this ring in any size between four and 11, including half sizes. Because of its simple band, this ring is a great candidate for resizing if you finger size changes over the years. 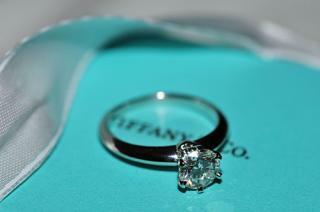 Tiffany & Co. sells this gorgeous ring with a wide range of Tiffany-certified diamonds, all in a round brilliant cut. You can purchase this simple solitaire with a 0.25-carat gem if you are on a budget or go as large as you would like if you want to make a statement. The price of the ring varies significantly depending on the size of the diamond you select, ranging from about $1,800 for a 0.25-carat gem to $53,000 and up for 2.5-carat or larger diamonds. Because the setting is elevated and open between the prongs, it allows the maximum amount of light into the stone, emphasizing its refractive and reflective properties that create the distinctive diamond fire and sparkle. Six prongs make this setting is relatively secure, and properly spaced and finely crafted prongs are strong and durable without detracting from the beauty of the stone. Because Tiffany & Co. uses only the most perfect gems in their designs, simple, open settings are useful to highlight the startling beauty of those gems. The openness of the setting can also create the illusion of a larger carat size, giving couples the option of choosing a higher quality though smaller stone without losing the appeal of an immaculate ring. The genuine Tiffany setting is a classic choice for brides-to-be, but the designer name isn't a practical option for every couple. While authentic Tiffany rings come with gorgeous diamonds, exceptional craftsmanship, and brand-name cache, they also carry a higher price tag than many alternatives. Round Cut Lisa Ring - This beautiful option from Gemvara features a 2.9mm rounded platinum band and a simple six-prong setting very similar to the genuine Tiffany version. It comes with a 0.8-carat diamond, but you can also customize it with the gemstone of your choice. Available in sizes four through 10, it retails for about $3,900. 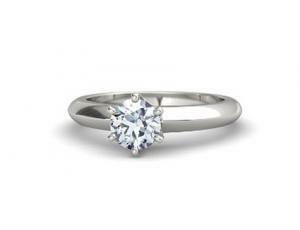 Platinum Comfort Fit Ring Setting - This simple solitaire from Brilliant Earth features a 2mm band and four prongs to support a round brilliant diamond. Although it has only four prongs instead of Tiffany's six, this setting offers a similar look for a more affordable price. Available in any size, it retails for about $800 for the setting alone and accommodates most round diamonds. Low Dome Comfort Fit Platinum Ring Setting - Blue Nile also offers a lovely Tiffany-style option with four prongs. The platinum band is 2.5mm wide and rounded for comfort. Once again, this setting has two fewer prongs than a genuine Tiffany version, but is very affordable. The setting alone retails for $730. You can have it set with a round diamond of your choice and sized to fit your finger. An authentic Tiffany setting will be excellent quality, but a Tiffany-style ring from another jeweler may not meet those high standards. It's important to check the quality of a Tiffany-inspired ring before you buy because there are no elaborate details in this setting to detract from minor imperfections. 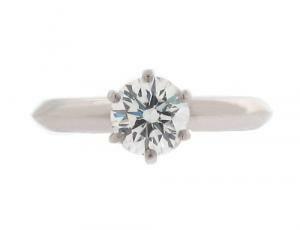 Look for evenly spaced, symmetrical prongs that match up with the ring band as well as the stone's symmetry. Make sure the prongs are thick enough to provide adequate security but thin enough not to detract from the stone's beauty. The stone should be level in the prongs and securely held by small rims in each prong. The prongs should be rounded and smooth to lessen chances of snagging on clothing, hair, or other items. Because the tiffany type setting is so open, the diamond's color and clarity are of utmost importance when choosing a quality ring. Even small imperfections may be noticeable without a concealing setting or additional accent stones to distract the eye, because the simple setting immediately draws attention to the center stone. Whether you buy a genuine Tiffany setting for your engagement ring or choose a ring that features some of the classic elements of this popular design, you'll find that this is a ring that never goes out of style. After more than a century of popularity, this ring style is a guaranteed classic. It will be as lovely on your 50th wedding anniversary as it is on the day you get engaged.